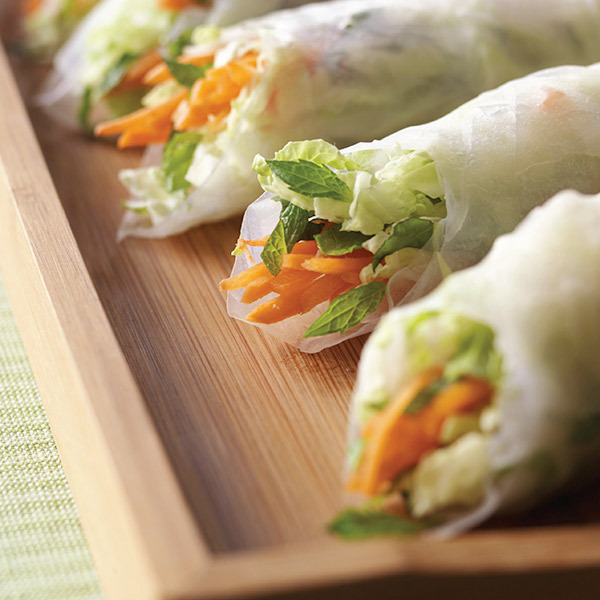 These Thai Salad Spring Rolls offer a tasty twist on traditional game-day appetizers. Packed with fresh herbs and vegetables—shredded napa cabbage, grated carrots, chopped mint and basil—plus dry-roasted peanuts, these spring rolls offer a satisfying crunch your guests will love. Serve this easy spring roll recipe with our homemade peanut sauce for dipping. Make the rolls: In a large bowl, toss together the napa cabbage, carrots, mint, basil and peanuts. Measure out ¼ cup of the peanut sauce and toss with the vegetables. Line a tray or platter with damp paper towels. Fill a round cake pan (or other shallow bowl) with hot water. Soak a spring roll wrapper for a minute or so—just long enough to make it flexible, but not longer, or it will start to disintegrate. Place the spring roll wrapper on a work surface. Scoop out ⅓ cup of the vegetable mixture and place on the bottom half of the wrapper. Fold the bottom edge of the wrapper over the filling, and then fold in the 2 sides. Gently but firmly roll the wrapper up to the top. Place the roll on the tray, and cover with damp paper towels. Continue until all of the filling is used up, keeping the rolls covered with damp towels. To serve, cut the rolls in half with a sharp, serrated knife. Drizzle some sauce into the open end of the rolls. Set out the bowl of peanut sauce for spooning into the rolls.